Seven days after failing to score an offensive touchdown and compiling just 122 yards in total offense in a 26-7 loss at San Diego State, UNLV rolled up 535 yards while pulling out a wild 41-38 Mountain West Conference victory over Hawaii at Aloha Stadium on Saturday night. Evan Pantels’ 28-yard field goal with 49 seconds left barely went inside the left upright and won it for the Rebels (3-4, 2-1), who departed Honolulu with a victory for the first time since 2000. That John Robinson coached squad went on to whip Arkansas, 31-14, in the Las Vegas Bowl 19 days later for one of the biggest wins in school history. Tony Sanchez’s Rebels now must win three of their final five games – vs. Colorado State, at San Jose State, vs. Wyoming, at Boise State and the Fremont Cannon finale at Sam Boyd Stadium against UNR – to get to the magic six-win total necessary for bowl eligibility. If redshirt freshman quarterback Dalton Sneed can continue to play like he did Saturday night against the Rainbow Warriors (3-4, 2-1), that may be a very real possibility. Sneed, who completed just 2 of 12 passes for nine yards and an interception in last week’s loss to the Aztecs, bounced back in a big way, completing 19 of 27 passes for 279 yards and two touchdowns while also rushing for 61 more yards on 11 carries. The Rebels also got big games from sophomore running back Lexington Thomas, who rushed for 102 yards and a touchdown on 21 carries and also caught two passes for 43 yards and another TD, wide receiver Devonte Boyd, who caught six passes for 83 yards and a touchdown, and running back David Greene, who had two short touchdown runs. But it was a defensive play that featured senior linebacker Tau Lotulelei (7 tackles) and cornerback Darius Mouton (6 tackles, 5 pass breakups) that proved to be the turning point in a game that featured six ties and four lead changes. Four plays after a highlight-reel 34-yard touchdown run by Thomas tied it, 38-38, Lotulelei chased down scrambling Hawaii quarterback Dru Brown and stripped the ball away, and Mouton scooped the fumble up and appeared to return it for a touchdown. An illegal block out of bounds erased the score but the Rebels, who took over on their own 45 with 2:36 to go, then drove to the Hawaii 10-yard line where Pantels booted the game-winning field goal with 49 seconds remaining. The win snapped a six-game road losing streak for the Rebels dating back to a 23-17 win at Nevada on Oct. 3, 2015. 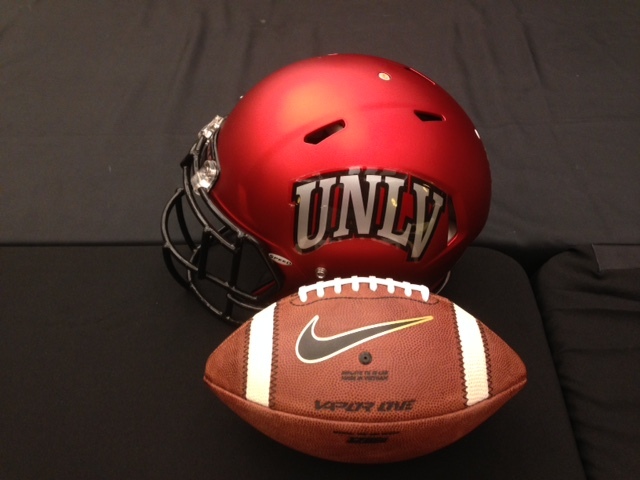 UNLV returns home to face Colorado State on Saturday at 2:30 p.m. at Sam Boyd Stadium. Click on graphic below for complete game stats.